So say the wine makers at Gianni Brunelli, a stunning family run vineyard on a hillside close to Montalcino, and quite frankly, I’ve never in my life heard a more perfect sentiment. 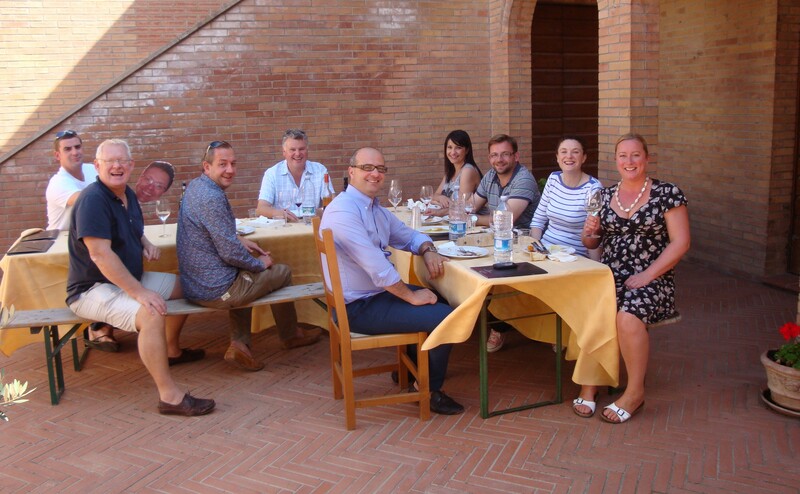 This year’s tasting trip, courtesy of our fantastic suppliers, Majestic, was a Tuscan whirlwind. Exactly 48 hours from start to finish, and stuffed full of incredible wine and the gorgeous cuisine for which this particular region of Italy is so deservedly renowned. Not to mention the breathtaking beauty of the rolling countryside, which thanks to last week’s unusual weather, was cloaked in the blurry haze of a heat wave. 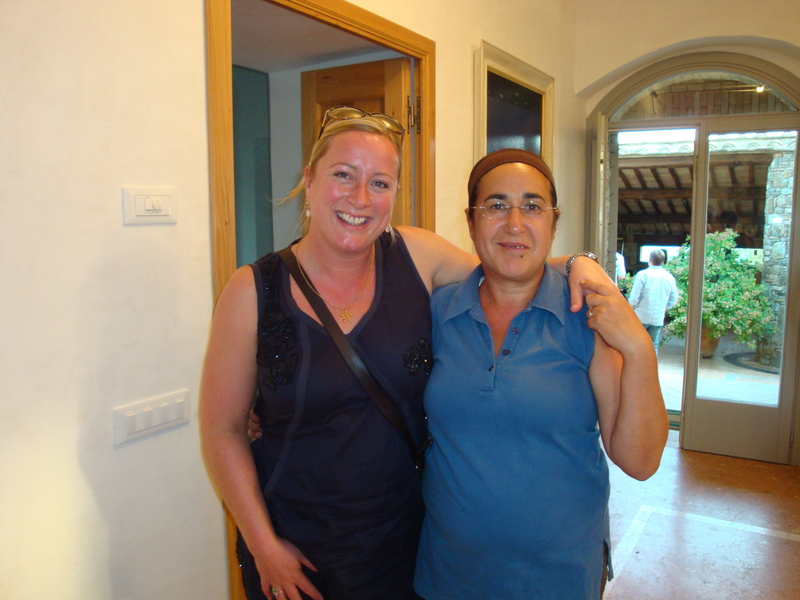 At the beautiful home of Laura Brunelli and her late husband, Gianni, we sipped our first taste of the lovely, soft deep-ruby wine of Montalcino, made from the Sangiovese grape, and fell in love with both Laura and her organically and passionately made Brunello. But long before Laura and Gianni began making wine, came their fabulously atmospheric restaurant in the heart of Siena, l’Osteria delle Logge, which in 2009, celebrated it’s 30th year. 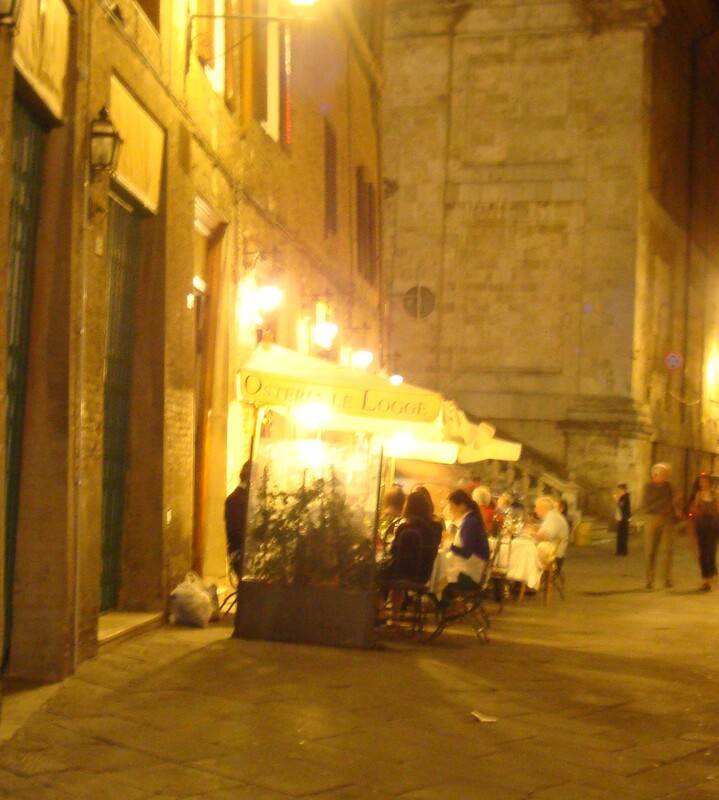 On an ancient paved street, a stones throw from the piazza, we were lucky enough to have supper here; our table placed next to the vast floor-to-ceiling doors which were flung open onto the little alfresco area, lit with a glowing warm lamp-light. 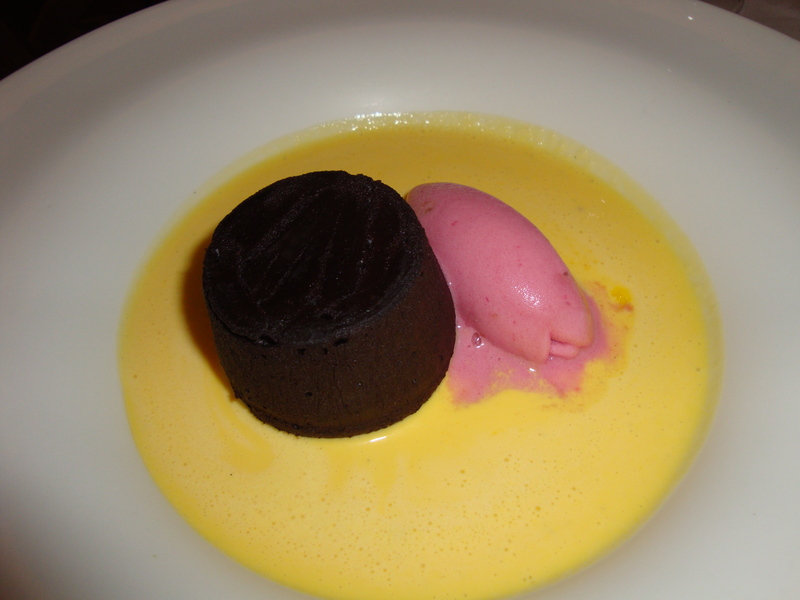 On that night Le Logge was full-up and buzzing, and the wine and meal were both delicious. 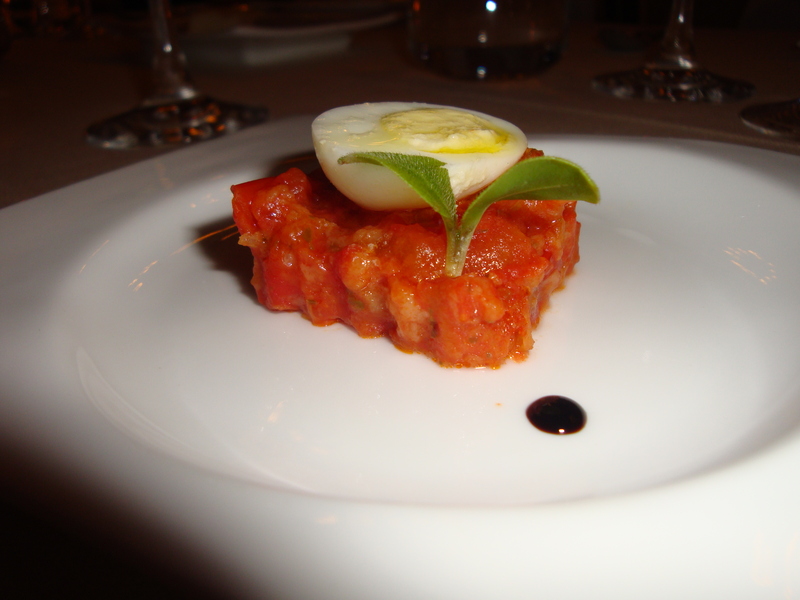 I began with a classic Vitello Tonnato, thin slices of cold veal and a silky pungent sauce flavoured with tuna. 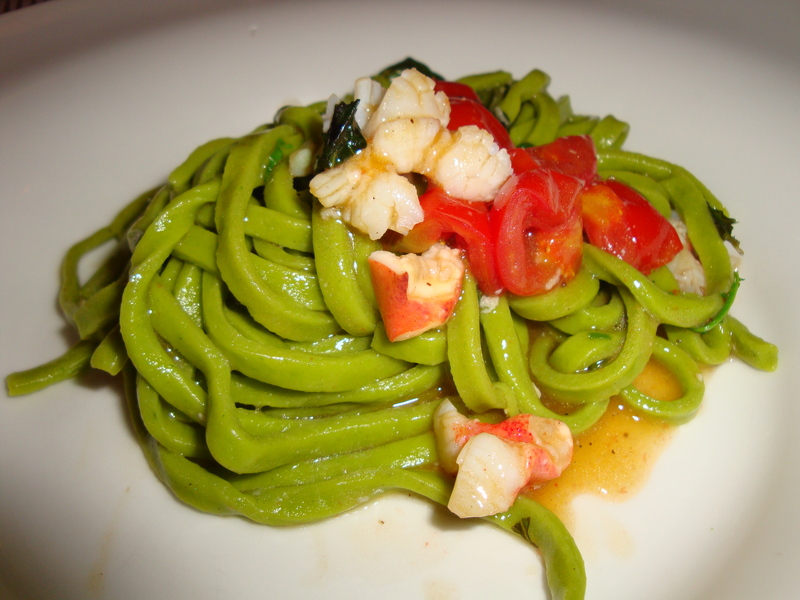 Then an amazing pasta course of ‘Chitarra’ with pine-scented lobster and rocket. 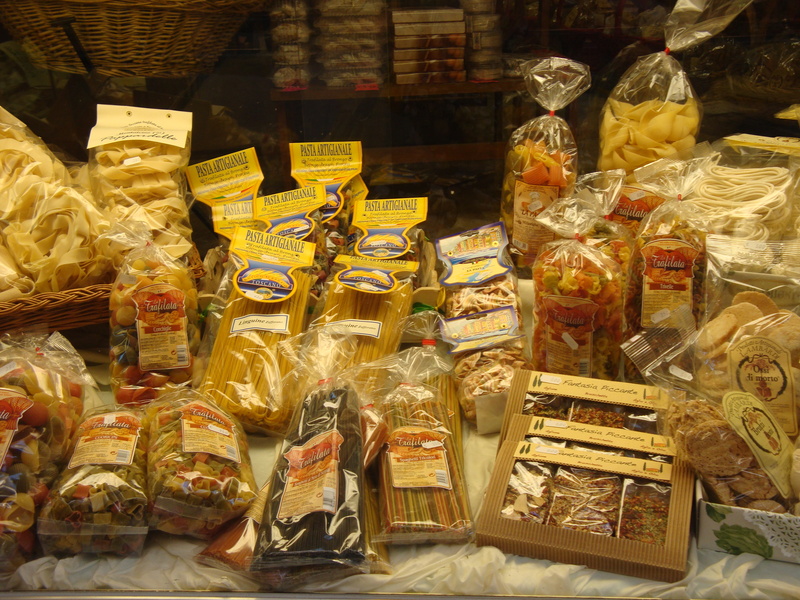 The Chitarra are made using a special pasta maker which cuts the thick dough into noodles through a sort of ‘kitchen harp’, giving the pasta a special chewy texture that is satisfyingly toothsome. 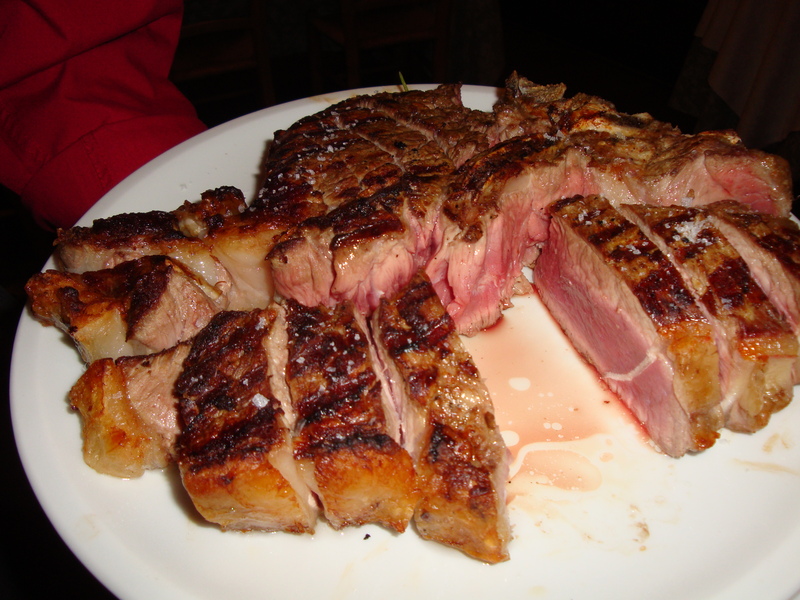 When I saw Bistecca alla Fiorentina on the menu that was me sorted, and I thankfully managed to persuade 3 of my fellow flesh addicts to share it, which meant we could have a huge T-Bone close to 2 kilos between us. It could have been seasoned more heartily and left of the grill a little longer for my taste, but despite that there was still nothing left by the time we’d finished with it. Incredibly generously, Laura had arranged for us to be plied with numerous bottles of red wine throughout the evening, culminating in a 1994 Brunello di Montalcino, from her Brunelli estate. After puddings and Vin Santo, we staggered to the Piazza del Campo for night-caps. We hardly needed more to drink but the lure of the stunning medieval, shell-shaped piazza, fringed all around with cool little bars twinkling under the night sky, meant it just had to be done. Sadly no time for shopping. Boo hoo. 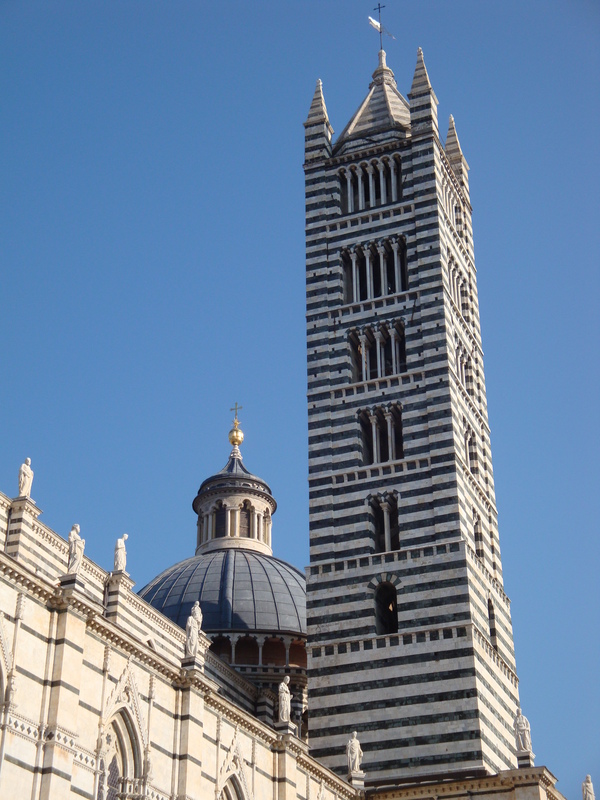 We had time for a quick walk through Siena the following morning, before our visit to Tenimenti Angelini, for a tasting and lunch with Eva, and Angelini’s chief wine maker of the Tuscan region. 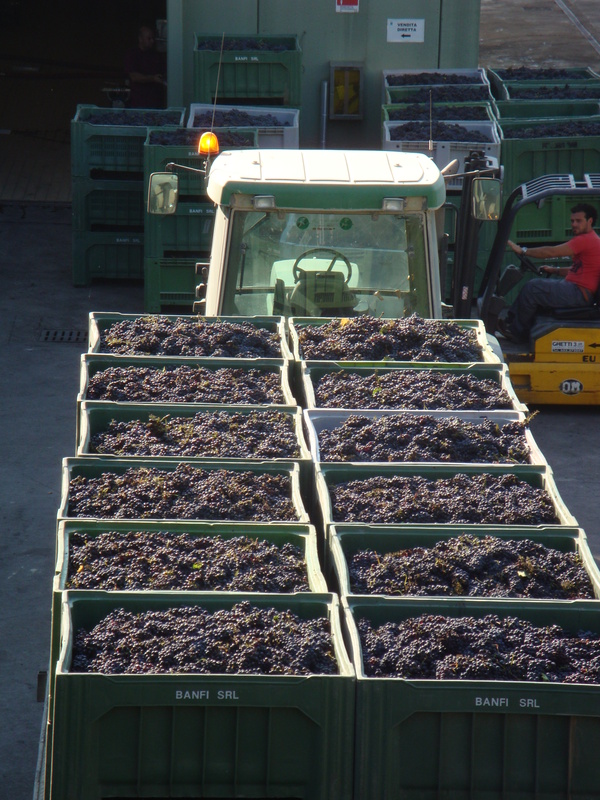 Theirs was a different operation to Brunelli’s, producing 200,000 bottles per year. The cellar was stunning and after a tour and tasting of Brunello, Trerose, and San Leonino Chianti, we sat down with them to a simple tasty Tuscan lunch of local antipasti and a bowl of creamy vegetable and barley soup. 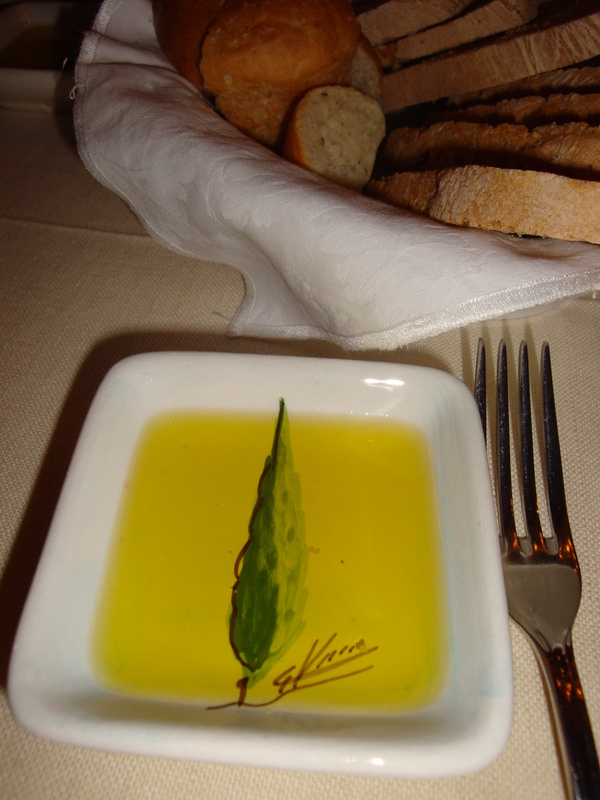 We also got to sample their own spicy, bright olive oil, and afterwards – and only for the brave – their grappa. I love grappa since developing a taste for it long ago on a boozy ski-trip to the Italian Alps, and this one was the best I’ve ever had, golden coloured with a rich caramely flavour, and of course one-hell-of-a-kick! We just had time to check in to the Hotel dei Capitani in Montalcino before our visit to Banfi, a mind-blowing Disneyland of a winery. 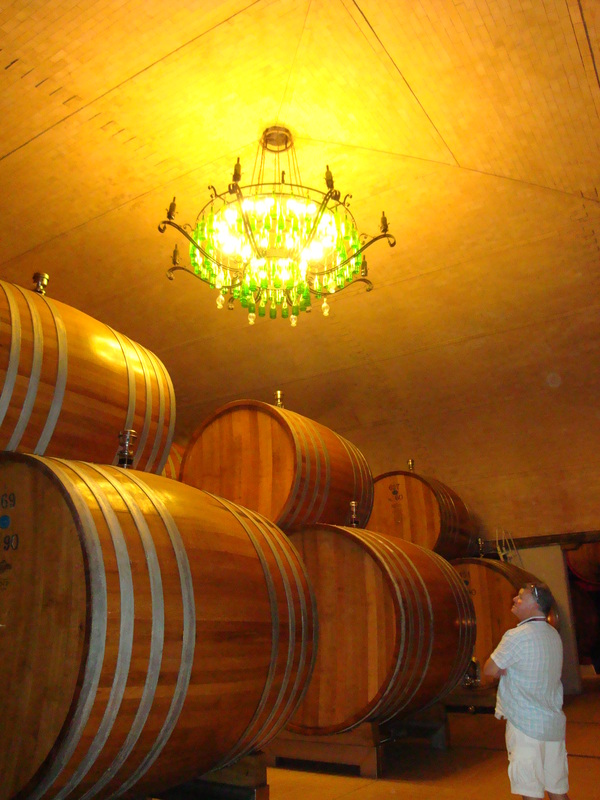 A sort of Willy Wonka’s Wine Factory tour! How about these Banfi barrels?! 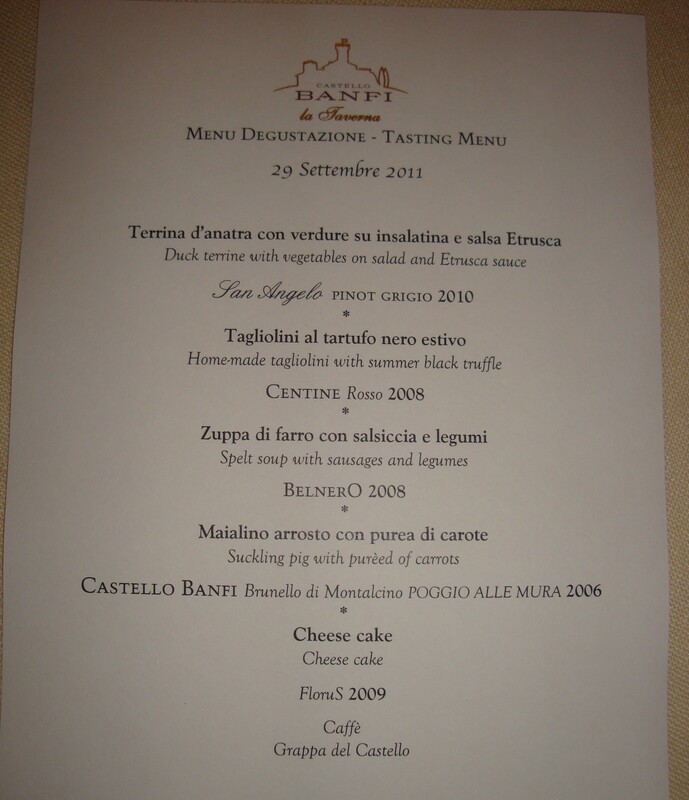 Of all the vineyard visits I’ve been lucky enough to experience on these trips, Banfi really was something new. 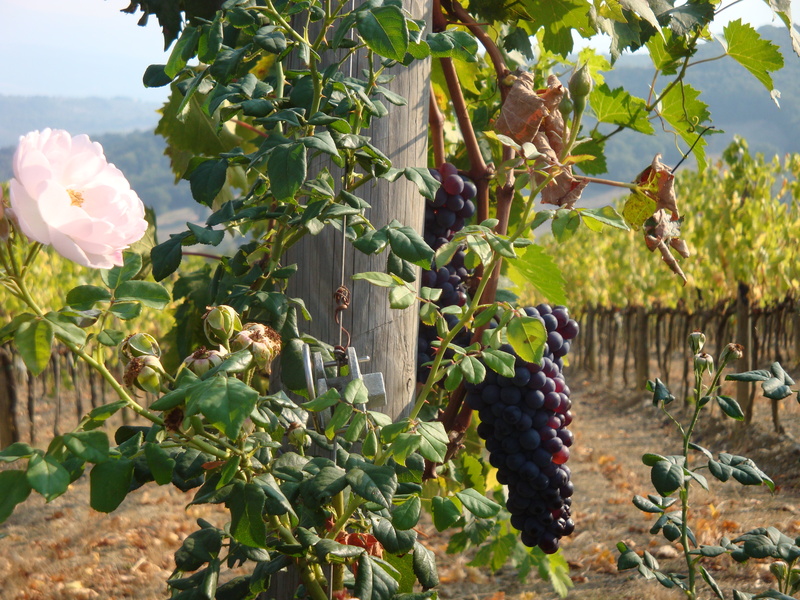 They have taken vinification technology and organisation to a stratospheric level. The whole set up makes you instantly assume it has been centuries in the making, when in fact it’s less than 30 years since Castello Banfi began producing wine. 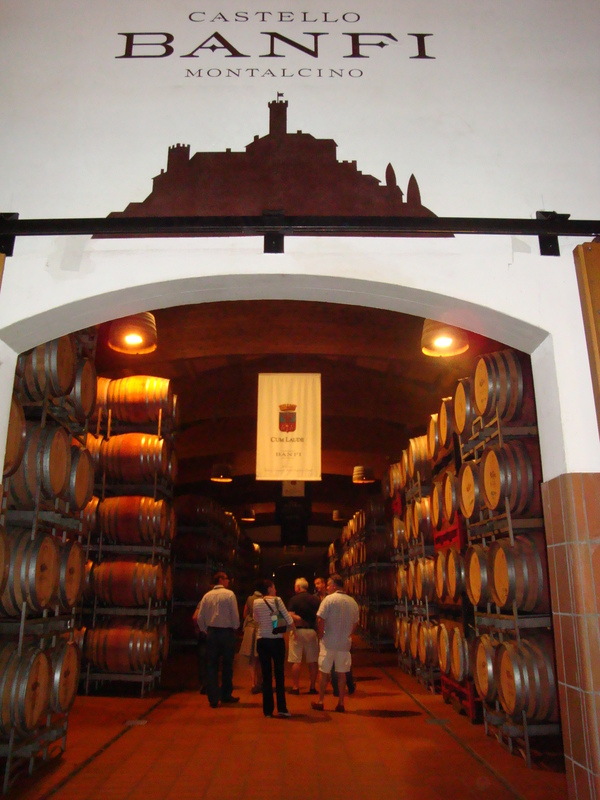 The land and castle were bought by a pair of American brothers, the Mariani’s, in the late 70’s and early 80’s, and in the relatively short period since then they have built this empire and now produce 11 million bottles of wine every year. Yes I said 11 MILLION! If that’s not enough to make you feel inferior, Castello Banfi also incorporates a top class hotel with currently 14 luxury rooms and suites (they are undergoing renovations to increase capacity), and a restaurant ‘La Taverna’, in the shadow of the medieval castle, where we had our final supper in Tuscany – a 5-course tasting menu with Banfi wines and yet more grappa. I’ve just had to pinch myself – I really am so lucky! 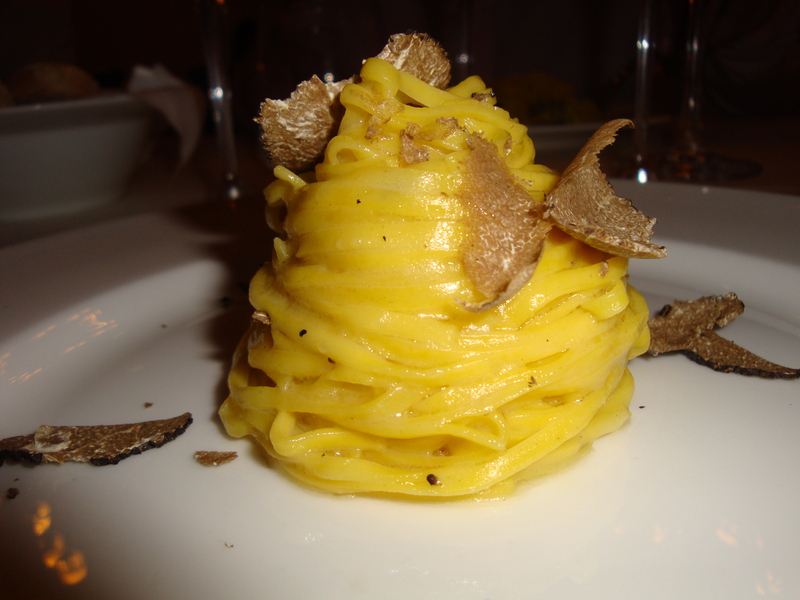 The ubiquitous (at this time of year) truffle linguine MY FOOD HELL! 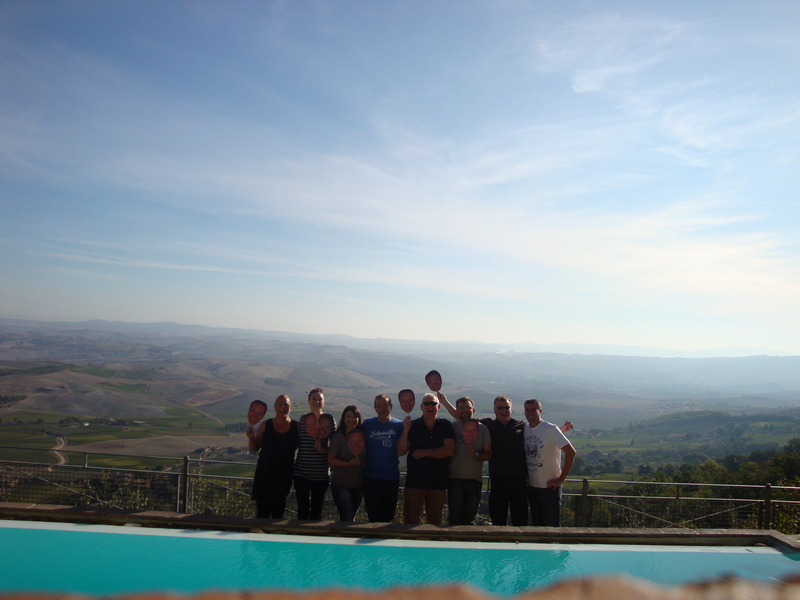 Before leaving the following morning, there was just time for a quick group shot in front of the incredible back-drop of the Montalcino valley which seemed to go on forever behind us. So anyway, until next time, Salute! What can I say. Wow. Another mouth watering post! Whose face is on the flag things you’re holding in the group shot? Keep up the good work! It’s the lovely Mark Reynolds who arranged the trip, but sadly couldn’t make it – his face is in nearly all the people photos though!